Professor Lowell H. Hall is a physical chemist who pioneered methods of molecular structure representation for the past thirty years. He received the PhD degree in Physical Chemistry from The Johns Hopkins University and pursued post-doctoral work at The National Bureau of Standards and Oak Ridge National Laboratory in single crystal x-ray crystallography. 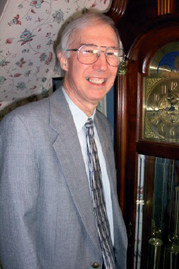 For thirty-eight years Hall has been Professor of Chemistry at Eastern Nazarene College, a liberal arts college in Quincy, MA. 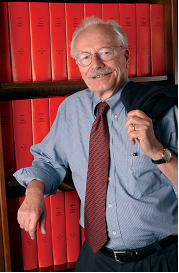 Hall began his research in QSAR during a sabbatical leave with Lemont B. Kier at Massachusetts College of Pharmacy in 1974. Together Hall and Kier have written four books, eight book chapters, and more than 100 papers. Their most recent book, "Molecular Structure Description: The Electrotopological State" (Academic Press, 1999) presents their E-State approach to molecular structure representation. Hall and Kier are the co-developers of the structure-information representation method as well as topological QSAR. In the middle 1970’s, Professor Kier and Professor Hall developed non-empirical molecular descriptors named molecular connectivity indices. Information derived from these indices is a non-empirical estimate of the valence state electronegativity, called the Kier-Hall electronegativity, closely correlated with the Mulliken-Jaffe electronegativity values. In the mid 1980’s Kier introduced the kappa indices, encoding information about several aspects of molecular shape and flexibility. Another approach to structure description was developed by Kier and Hall, in the early 1990’s. This set of descriptors is called the electrotopological state (E-state) and is based upon the Kier-Hall electronegativity and the topological characteristics of an atom or group in a molecule. Professor Lemont B. Kier received a BS in Pharmacy from Ohio State University and a PhD in Medicinal Chemistry from The University of Minnesota. He has been a pioneer in the development of several theoretical methods used for rational drug design, based on molecular structure. He introduced the use of molecular orbital theory to compute the preferred conformation of molecules. New insight into the pharmacophores of several neurotransmitters and drug molecules were predicted by Kier using these calculations. In another application, Kier pioneered in the use of M.O. calculated energies to predict intermolecular interactions, now called molecular docking.